In "My Thirty Years in New York City," the author reaches out to young actors while he opens up about his journey to achieving his dreams in New York City from 1973 to 2003. “While opening up about his experiences, the author imparts an important message to his readers: to live life to the fullest and to never stop doing what each person loves”. When John Joseph Strangi first visited New York City when he was eleven, he was instantly captivated with the big and lively city. As he worked to make a name for himself, his love for the city never wavered. Today, he shares his experiences and gives readers a glimpse of the energy and magic that comes with the city. “My Thirty Years in New York City” tells the author’s experiences and journey towards turning his dreams into a reality. It provides a glimpse of his career in the entertainment industry in the Big Apple. While opening up about his experiences, he imparts an important message to his readers: to live life to the fullest and to never stop doing what each person loves. As he narrates his story, Strangi also reaches out to young actors of the new generation. He encourages them to always reach for their dreams. And if their greatest dreams don’t come true, there are many other dreams that will become a reality in New York City. 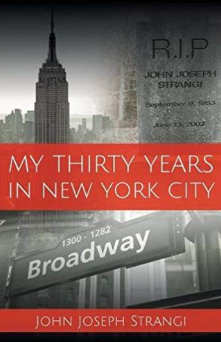 Catch Strangi’s “My Thirty Years in New York City” as it joins the upcoming Los Angeles Times Festival of Books. The celebration will take place on April 13-14, 2019 at the University of Southern California. Don’t miss it!